There’s nothing worse than sitting in your sticky, humid home in the middle of the summer trying to keep cool with a glass of lemonade. Don’t let it get to that point. Stryker’s here to help. Just like in the heating department, Stryker Heating, Cooling & Plumbing only sells and installs the best equipment from top-rated manufacturers. Why? Because we care about our clients and want them to udnerstand that a new central air conditioning system is a significant investment, so they deserve the best. The quality of these products and our installation will stand the test of time and allow you to remain worry-free. 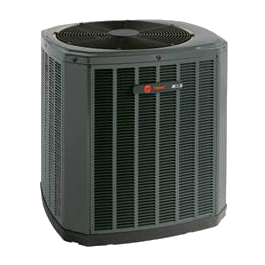 We can assure you that you’ve made an energy-efficient choice in home comfort when you select an air conditioner from one of our manufacturers, but keep in mind, when buying a home comfort system, selecting the right sixe is crucial. An air conditioner that is too large will cool your home quickly, but you may still feel uncomfortable. Why? Because it will satisfy the thermostat before it can remove moisture from the air. As expected, a system that is too small cannot get the job done. Stryker can help you determine the right size system for your home.